This Cardio Fitness Treadmill have a striking design aesthetics combined with unmatched customization and personalization options. The T7-0 is as unique as you are. From the adjustable FlexDeck® Select to programs that record and remember your every move, the T7-0 delivers a workout that is just what you want it to be. We designed it to be the perfect treadmill for the home. You design it to be the perfect treadmill for you. 4 user profiles store personal settings and custom workouts. Each user can create 7 My Workouts™ personalized workouts and 7 custom workouts. Touch-sensitive, ergonomically placed controls, including a lower control pad that brings the buttons you use most often closer to you. And the GoSystem Quick Start feature remembers your preferred walk, jog and run speeds, as well as three different incline positions, so you can get started with the push of a button. The patented FlexDeck Select shock absorption system allows you to adjust the firmness of the running surface to match different outdoor conditions or preferences in your household. The FlexDeck also reduces impact to joints by nearly 30% compared to ordinary treadmills. Deluxe LED console with back-lit TouchSensor™ buttons that guide the user through their workout keystrokes. Features message center providing workout feedback and a workout profile display that shows workout progress. Built-in reading rack plus dual cupholders and a front-mounted accessory tray to hold cell phone, MP3 player, or remote. Removable cupholders make cleaning a snap. *Note: Most of the sites, stores or shopping portals listed above sell Cardio Fitness T7.0 Treadmill with discounts and other exciting offers. There is a possibility that the some of above websites are not selling Cardio Fitness T7.0 Treadmill now. Toughtrain.com is not liable for such cases or instances. 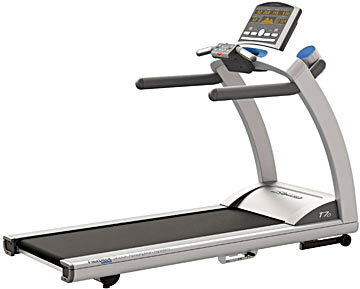 Also we do not recommend any seller for Cardio Fitness T7.0 Treadmill and a buyer should buy from where he/she gets best deal with quality of products, service and on time delivery (shipment).